The BBC's Circular Economy series highlights the ways we are designing systems to reduce the waste modern society generates, by reusing and repurposing products. This week we look at compostable and biodegradable packaging. Stonehaven, a seaside town just south of Aberdeen on Scotland's east coast, first made its culinary mark with the invention of the deep-fried Mars Bar. These days it's making a new gastronomic name for itself, thanks to the success of The Bay, the local fish and chip shop. Right on the harbour front, seagulls swoop overhead, and the waves rolling in from the North Sea sometimes crash right up against the door. But, alongside its picturesque location and traditional menu, The Bay is scoring points when it comes to sustainability. 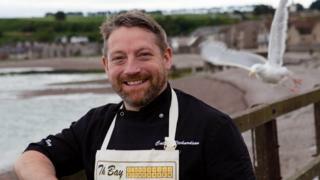 Partly because the natural world is so literally on his doorstep, chef Calum Richardson decided right from the outset The Bay wouldn't be leaving a waste trail of plastic cutlery, pots and packaging. So all of the tableware he uses from tea cups to knives and forks is 100% compostable. "The packaging I use for fish and chips is quite expensive compared to what a lot of other businesses are using," admits Calum, "But I thought, I'll put 10p on the product and have a clear conscience." Above all sustainable packaging reflects the kind of image he's after at The Bay. "I'll tell people I'm using good quality fish, and the right packaging." His takeaway fish suppers are served in brown cardboard boxes. The cutlery is made of a plant-derived bio-plastic known as CPLA (made from polylactic acid). One or two of the more argumentative customers like to point to the transparent tubs he uses for tartare sauce and accuse him of double-standards. They look just like plastic, but those too are compostable, made from corn starch. If a material is certified as compostable, it means that under specified conditions, it will break down within 12 weeks. Materials that will biodegrade, creating an organic product that can be dug back into the soil, offer an attractive solution for restaurants like Calum's, that are looking for practical ways to serve takeaway food, without adding to the mountain of plastic waste that's a by-product of our modern lifestyles. The particular beauty of composting is that food waste - smears of tomato sauce, left-over mushy peas, the odd greasy chip - can be ignored, since they are all part of a happy compostable mix. But dig deeper and it's clear there are challenges too. The flood of new materials that claim to be "biodegradable" can be misleading, says David Newman director of the Bio-based and Biodegradable Industry Association. "There are a lot of snake oil salesmen on the market at the moment, saying their product is biodegradable," he says. But there is no legal definition for the term biodegradable - it could be applied to materials that would take decades to break down. But even with compostable items, you can't just toss them in the regular bin. "If you put a compostable item in general landfill waste, it will just lay there for ever like plastic," explains Mr Newman. "It's a storage unit. The whole point about landfill is we don't want biodegrading to happen because it produces methane." "Nor is it simply a question of chucking these items into your green waste bin, the contents of which are destined for the most common kind of compost facility known as 'open windrow sites'. Windrow sites are not permitted to take food waste for hygiene reasons; it has to be treated in closed systems. "So unless the items are completely free of food waste, they need more specialised processing at 'in vessel' composting facilities. While there are a number of these around the UK, there is limited infrastructure for collecting and delivering food and food packaging waste to them. "And in-vessel composting facilities only accept such waste after they've established it won't be contaminated by other materials, such as plastic. It doesn't yet happen as a matter of course." Biodegradable v compostable - what's the difference? Biodegradable materials will break down naturally but there's no time frame specified, so a biodegradable fork could be buried for years without breaking down. Compostable materials will break down within 6-12 weeks in home or industrial composting facilities, but won't necessarily decompose if you just throw them under a hedge. Fortunately for Calum at The Bay, there is a local service that will collect and process his compostable waste. That is, in part thanks to Vegware, the firm that provides all of his compostable tableware. Vegware's mission is not only to sell its boxes, cutlery and tubs, but to focus on the whole lifecycle of the products. The Edinburgh-based firm has spent the last few years, working to establish a network of collection routes across Scotland. But not all parts of the UK are so well served. "There's an element of chicken and egg," says Joe Frankel, Vegware's founder and chief executive. "It's hard to get a route going until lots of people are using compostables. It's hard to get compostables used until there's a system for collection in place." Vegware also trains kitchen and serving staff, puts in new bins and new signs to help with waste sorting, and will even hold customer engagement days to educate consumers on the new tableware. The aim is to ensure composters don't turn away contaminated waste. The firm has expanded beyond the UK, to the rest of Europe, Hong Kong and Australia. But it is San Francisco that Mr Frankel holds up as the textbook location for operating a closed loop system, where food waste and compostable packaging is returned to the soil as a matter of course. The city offers three waste streams in offices, homes and on the street. Separating off compostables is now second nature there, Mr Frankel says. That's because Californians, so reliant on agriculture, have an appreciation of the end product - the crumbly rich compost that can replenish nutrients in the soil. And that in the end could be the clinching argument elsewhere too, wherever modern agricultural techniques have taken a toll on topsoil. Charlie Trousdell, a veteran of the composting industry, who often speaks for the sector, says there are still challenges to overcome, especially when it comes to plastic contamination of the waste stream. But by putting the right systems in place, he thinks we could shift much more of our food waste to a system where it is recycled into the "magic" product that is compost. "The most critical step is for government to ban food and green wastes from landfill and to vastly improve the collection of food wastes from commercial premises," he argues. That would open the door for widespread use of compostable packaging, not just for takeaway food, but for groceries too, bringing down its price into the bargain. "We're not going to get it all right from day one but you have to have people being a bit visionary. You have to start somewhere."